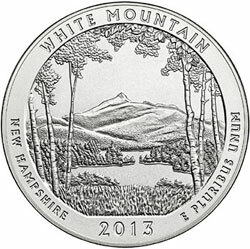 The 2013-P White Mountain Five Ounce Silver Coin has sold out at the United States Mint after less than five months of availability and at a sales level below the maximum mintage. The latest US Mint numismatic product sales report examines the week’s three top sellers. CoinWorld covers some recent significant sales of an 1864 Proof Indian Head Cent for $141,000 and a Mint State 64 1795 Capped Bust Gold Eagle for $264,500. Coin Rarities and Related Topics discusses the Draped Bust Quarters of the Fabulous Eric Newman Coin Collection. A U.S. federal bond issued to and signed by George Washington while he was president will be offered at an upcoming auction. Information on the 1952 “Superbird” Quarter. PCGS is offering webinars which provide a preview of coin grading courses. The Numismatic Crime Information Center will conduct a seminar on numismatic crime investigation for local state, and federal law officials at the FUN Convention in January. The Royal Mint has announced a new series of coins to mark the Christening of Prince George of Cambridge. This article provides some additional images, videos, and quotes from the designer of the coins. Separately, the Royal Mint Blog shares some secrets of Christopher Ironside’s decimal coin designs. A new series from the National Bank of Denmark honors four Danish scientists. And now for some notable auctions. First a lot of 10 GSA Carson City Morgan Dollars across three dates. The coins each come in their original GSA boxes with COAs. Next, a double denomination error consisting of a 2000 Lincoln Cent struck on a Roosevelt Dime authenticated by PCGS and graded MS67. That’s it for the update. See you next time!